So the pix above shows the delivery system for the tool we discussed in the last blog. 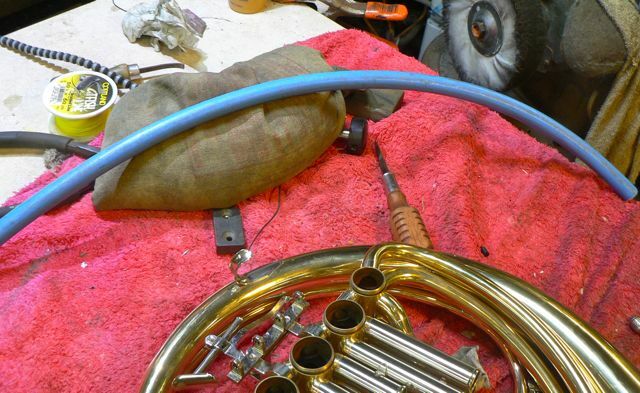 Above in atrocious Blue is a length of 5/8 ” ID flexible water pipe. 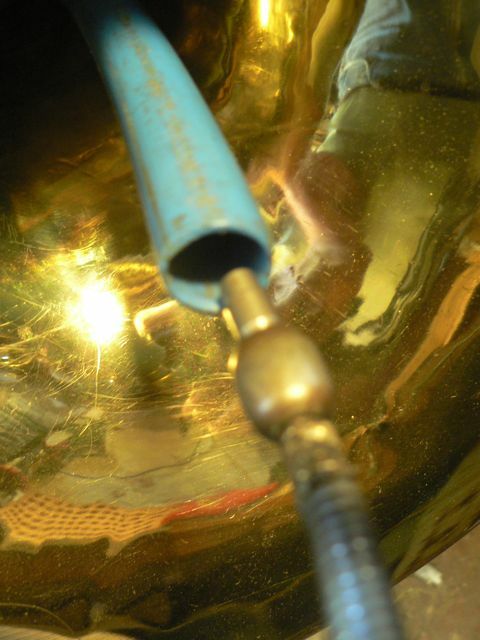 it is the outer shield to insert the auger driven dent ball into the horn without marring the inside of the bell tail. Another important part of the dent removal system is lubrication. 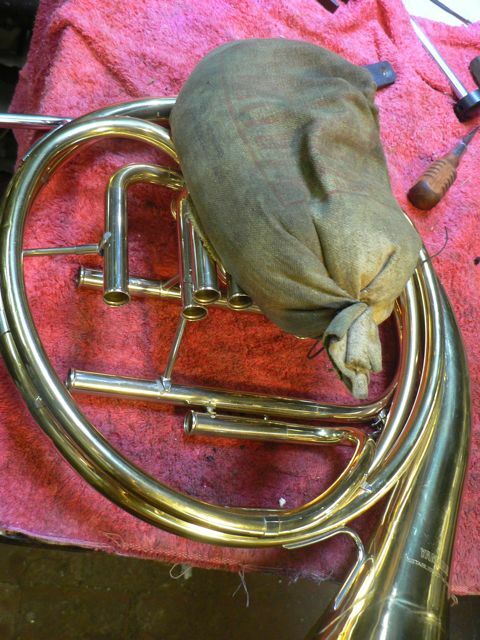 I’ve used liquid soap, anhydrous lanolin and lithium grease. 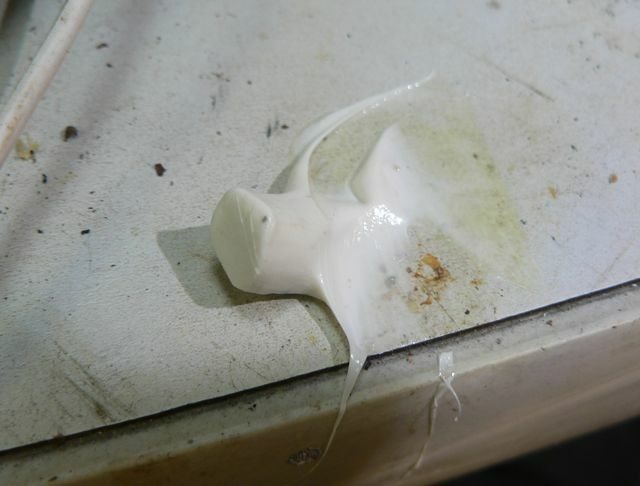 The pix above is a blob of lithium grease. 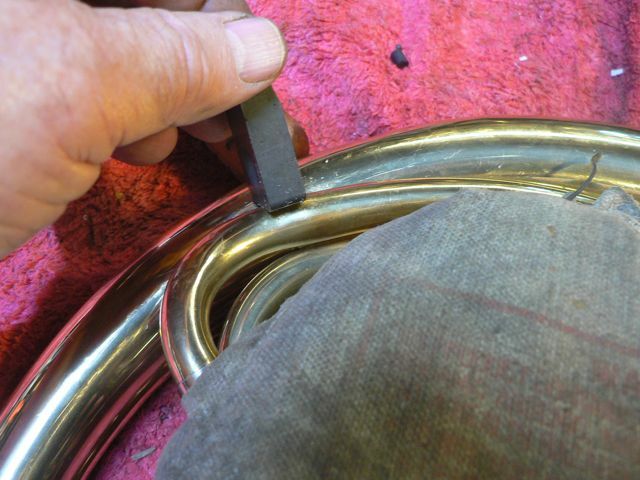 The lubricant is applied to the dent ball to make the passage past small dent easier. the blue water pipe w/o color altering, note the magnet and the sack of lead shot. (my third hand) . 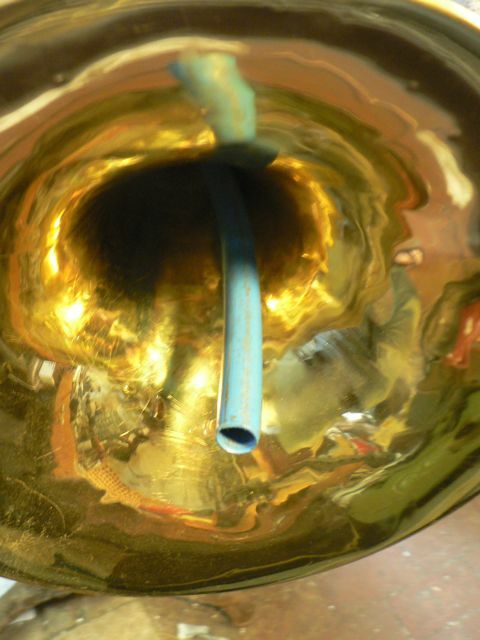 the flexible water pipe is inserted into the bell tail, it goes as far as the first branch ferrule. 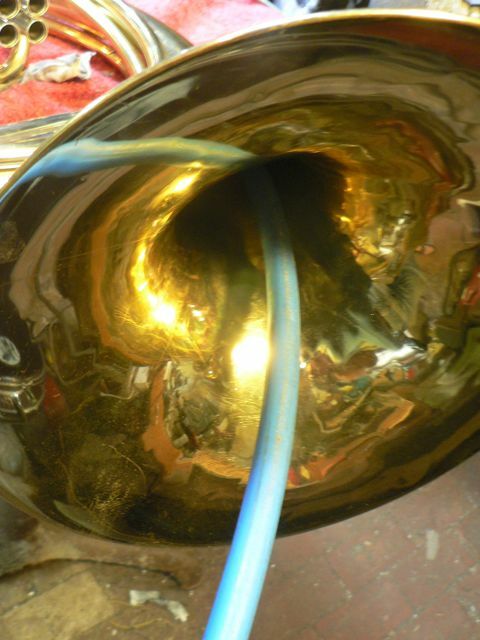 I generally push it in as far as it will go, the dent ball will be centered inside the water tube and the tube keeps the steel auger from banging on the inside of the bell tail. Pardon the out of focus pix. Note also that I’ve failed to put any lube on the ball prior to inserting it into the tube. 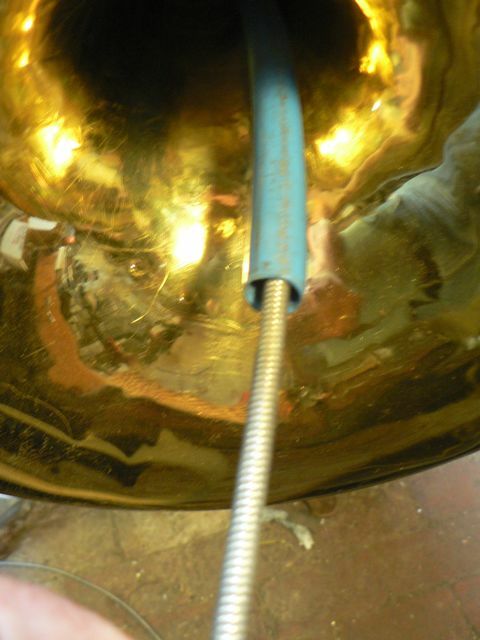 This is a dry run for the media… the dent ball is pushed into the water tube, which it completely pass through and continue on until it comes into contact with a dent upstream from the bell tail, (you can go all the way to the attachment of the first branch at the third valve. A magnet will tell you where the dent ball is. 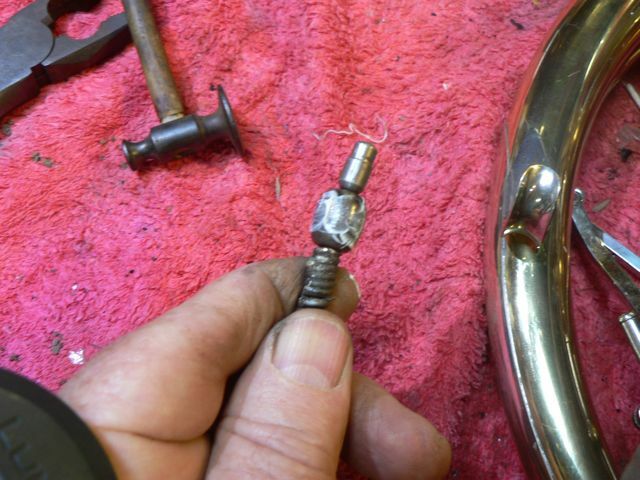 If there is a dent you can drive the dent ball into the branch untill it stops at the dent and then lightly tap with a dent hammer to begin to raise the dent. (an aside for the next two pix.) 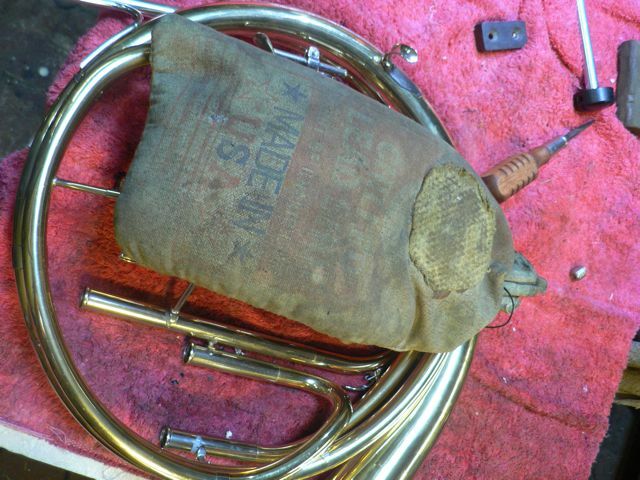 OSHA would not like this… I use a 20# bag of lead shot in its factory bag (note the patch) which will stabilize the horn and the shot is in a strong cotton bag that allows it to conform what’s under it without damaging the horn. As I mentioned above, my third hand. 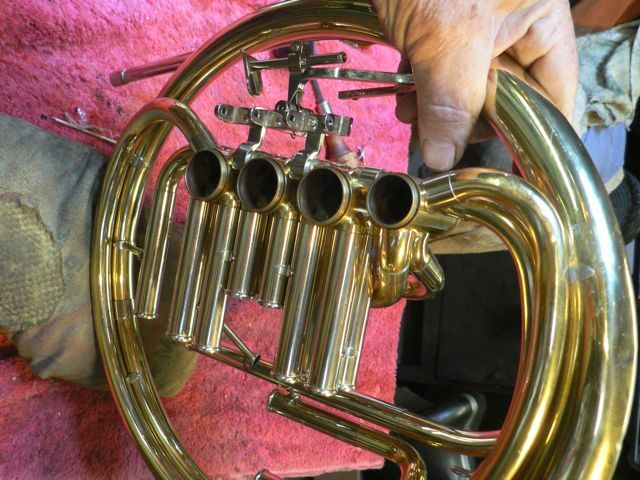 You’d be surprised at how much a bag of shot will stabilize a horn you’re working on. grease applied to the dent ball/ Done.